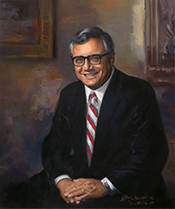 LaFALCE, John Joseph, a Representative from New York; born in Buffalo, Erie County, N.Y., October 6, 1939; graduated from Canisius High School, Buffalo, N.Y., 1957; B.S., Canisius College, Buffalo, N.Y., 1961; J.D., Villanova Law School, Philadelphia, Pa., 1964; lawyer, private practice; United States Army, 1965-1967; member of the New York state senate,1971-1972; member of the New York state assembly, 1973-1974; elected as a Democrat to the Ninety-fourth and to the thirteen succeeding Congresses (January 3, 1975-January 3, 2003); chair, Committee on Small Business (One Hundredth through One Hundred Third Congresses); not a candidate for reelection to the One Hundred Eighth Congress in 2002. Papers: In the Sierra Club National Legislative Office Records, 1960-ongoing, 200 linear feet. Persons represented include John LaFalce. Video Reels and Sound Tape Reel: 1982-1994, 6 commercials on 6 video reels and 1 commerical on 1 sound tape reel. The commercials were used during John LaFalce's campaigns for the 1982 and 1994 U.S. congressional elections in district 32 and 29 of New York, Democratic Party.